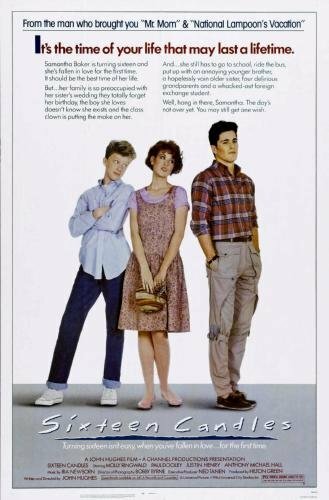 081 – Sixteen Candles | All Eighties Movies. All The Time! This entry was posted in Podcasts and tagged comedy, drama, romance. Bookmark the permalink. THANK YOU Gidget for telling me about your Blade Runner double podcast. You and Angry show such love with a 2 part pod cast. I’m loving this very much. Had no idea about your eighties podcast and now a fan! Sry – left on wrong movie. Listening to 16 Candles now – but listened to Blade Runner earlier. Love your diversity! You both read my mind re movies. This is my daughters all time best movie and I’d never seen it. She made me listen to your podcast then watch it. I could not agree more. VERY awkward scenes for these days. I’m glad I did not watch it with her. We had a looooong discussion after I saw this film. Just know you are both doing a good thing with pointing this out. Still a funny teen movie but certain things need to be addressed.